We love debuts. You love debuts. Authors definitely love their debuts. And when reviewers love a debut we get downright giddy. When DON'T EVER GET OLD, Daniel Friedman's debut Mystery, earned itself two starred reviews right out of the gate we had to pull out the emergency party horns (our buddies in the Academic Marketing Department were not impressed). UPDATE: DON'T EVER GET OLD now has four(!) starred reviews from Publishers Weekly, Library Journal, Booklist, AND Kirkus Reviews! 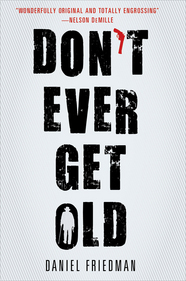 DON'T EVER GET OLD will be available in May from Minotaur Books.